This piece, by Ishmael Khaldi, originally appeared in the San Francisco Chronicle. For those who haven’t heard, the first week in March has been designated as Israel Apartheid Week by activists who are either ill intentioned or misinformed. On American campuses, organizing committees are planning happenings to once again castigate Israel as the lone responsible party for all that maligns the Middle East. Last year, at UC Berkeley, I had the opportunity to “dialogue” with some of the organizers of these events. My perspective is unique, both as the vice consul for Israel in San Francisco, and as a Bedouin and the highest-ranking Muslim representing the Israel in the United States. I was born into a Bedouin tribe in Northern Israel, one of 11 children, and began life as shepherd living in our family tent. I went on to serve in the Israeli border police, and later earned a master’s degree in political science from Tel Aviv University before joining the Israel Foreign Ministry. You are part of the problem, not part of the solution: If you are really idealistic and committed to a better world, stop with the false rhetoric. We need moderate people to come together in good faith to help find the path to relieve the human suffering on both sides of the Israel-Palestinian conflict. Vilification and false labeling is a blind alley that is unjust and takes us nowhere. You deny Israel the fundamental right of every society to defend itself: You condemn Israel for building a security barrier to protect its citizens from suicide bombers and for striking at buildings from which missiles are launched at its cities - but you never offer an alternative. Aren’t you practicing yourself a deep form of racism by denying an entire society the right to defend itself? Your criticism is willfully hypocritical: Do Israel’s Arab citizens suffer from disadvantage? You better believe it. Do African Americans 10 minutes from the Berkeley campus suffer from disadvantage - you better believe it, too. So should we launch a Berkeley Apartheid Week, or should we seek real ways to better our societies and make opportunity more available. You are betraying the moderate Muslims and Jews who are working to achieve peace: Your radicalism is undermining the forces for peace in Israel and in the Palestinian territories. We are working hard to move toward a peace agreement that recognizes the legitimate rights of both Israel and the Palestinian people, and you are tearing it down by falsely vilifying one side. If Israel were an apartheid state, I would not have been appointed here, nor would I have chosen to take upon myself this duty. There are many Arabs, both within Israel and in the Palestinian territories who have taken great courage to walk the path of peace. You should stand with us, rather than against us. 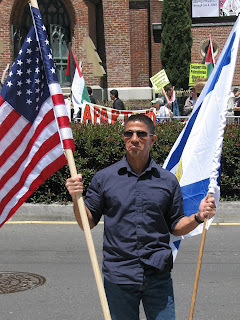 Ishmael Khaldi is deputy consul general of Israel for the Pacific Northwest. "We are working hard to move toward a peace agreement that recognizes the legitimate rights of both Israel and the Palestinian people"
The Ministry of Construction and Housing is planning to construct at least 73,300 housing units in the West Bank in 2009.
this is the policy you are being paid to defend. The "settlements" you are referring to include Betar Illit, Ariel, Givat Ze’ev, Maale Adumim, Efrat and Geva Binyamin- which both sides agree will remain with Israel and will not be part of any future Palestinian state. Incidently, most people who are acquainted with the history of the region do not consider Gush Etzion a "settlement" - this was Jewish land until it was ethnically cleansed by the Jordanians in 1948. If you aren't acquainted with the massacre of Kfar Etzion you should read about it- the surrendering Jews were mowed down by machine gun fire. Jews that sought shelter in a monastery were killed with hand grenades. We are not being "paid" to defend anything. We do this out of love and a sense of justice. And let's really get to the point here-- the organizers (and, presumably most supporters) of "Israel Apartheid Week" at UC Berkeley declare on their website (berkeley dot apartheidweek dot org) that "The system of Israeli Apartheid established in 1948 is the root of the conflict." So the issue of West Bank settlements in a straw man argument. They don't care whether Israeli sovereignty extends to the areas formerly illegaly occupied by Jordan or is only within the 1949 Armistice lines (which were never recognized by the Arabs as borders)--they don't accept the Jewish people's right to self-determination anywhere. And that is the policy that they are being funded to defend. Its a simple case of "words mean what I SAY they mean!" Although the word "apartheid", is a legal term of art, which includes a definitional requirement of race based intent, in addition to "separation. Its not just a matter of "what", but also "why." South Africa's specific intent was race based, both as stated and as practiced. Israel's specific intent is security based. It is both an abuse of the word "apartheid", and a libelous use, when applied to Israel. I meant that Khaldi is being paid to defend. How do separate legal systems, separate water and electricity and different voting rights for israelis and Palestinians living on the opposite side of the same road in the Territories qualify as security reasons? and the Jewish right for self determination should be exercised in a way that doesn't ignore other people's right for self determination, not by keeping Israeli Arabs under control or forcibly keeping refugees out of the country. not to mention legal barriers for Israeli Arabs wishing to live in Jewish-only communities within Israel, as exposed in the Qaadan case. What's the connection to security there? Uh, remember Oslo? The Palestinians are self ruled. "The aim of the Israeli-Palestinian negotiations within the current Middle East peace process is, among other things, to establish a Palestinian Interim Self-Government Authority, the elected Council (the "Council"), for the Palestinian people in the West Bank and the Gaza Strip, for a transitional period ". They would only be under the same laws as Israelis if they had been annexed,as as far as I can tell, neither the Palestinians nor the Israelis want that. By the way, where I live, and throughout America, each city town, county, etc has separate water, sewage and electrical systems.....and I'm sure its that way where you live, too.